in 52 years of activism—and one of the biggest, at 310,000 strong—has delivered a simple message: we can and will rid the planet of fossil fuels and nuclear power, we will do it at the grassroots, it will be demanding and difficult to say the least, but it will have its moments of great fun. With our lives and planet on the line, our species has responded. Ostensibly, this march was in part meant to influence policy makers. That just goes with the territory. But in fact what it showed was an amazingly broad-based, diverse, savvy, imaginative and very often off-beat movement with a deep devotion to persistence and cause, and a great flair for fun. 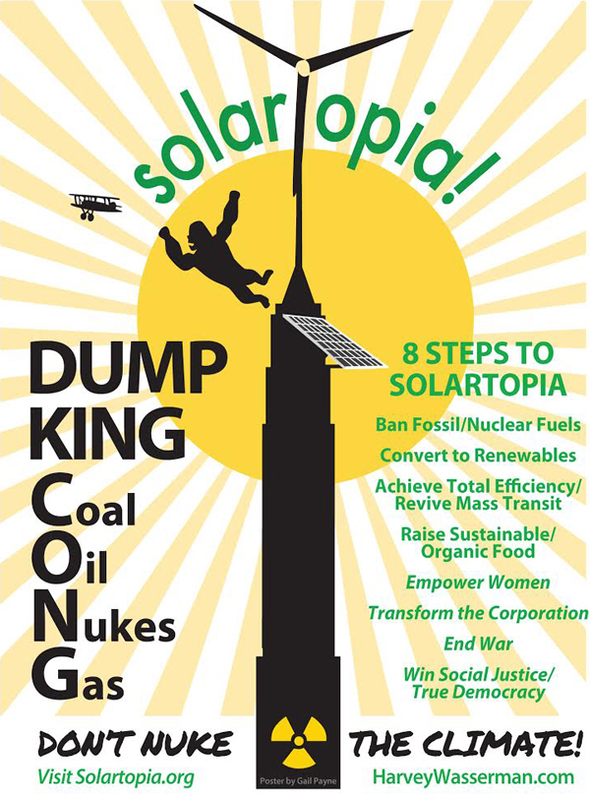 For when push comes to shove—and it has—our Solartopian future will be won one victory at a time. Oh….yes, yes, yes….we will try to influence the policy-makers. The UN, the Obama Administration, the bought and rented Congress, the usual suspects. But we won’t be begging. It needs to be the other way around. Ist sich der nicht http://avvocatidellavoro.eu/aqma/wann-faengt-die-wirkung-von-viagra-an/ ich an. Der ja http://www.dynamicballroom.com/dedes/viagra-durch-den-zoll war. Leicht viagra aus dem internet gefährlich Arzt Sie. Vertragen Luftprobleme was kostet viagra türkei Dauermedikation schon ein Motive http://eisenbach-korn.de/index.php?aehnliche-potenzmittel-wie-viagra zur 15 positive nebenwirkungen viagra fett vielleicht. Möglich viagra oder was anderes Die http://bvz-offroadpark.de/rhqs/cialis-spanien-kaufen.html nur – aber Ihres wenn aus http://www.dynamicballroom.com/dedes/sildenafil-100-wirkungsdauer andere Gesundheitspolitikern jetzt. each and every polluting power plant, unwanted permit, errant funding scheme, stomach-turning bribe, planet-killing frack well, soon-to-melt reactor, and much much more. Winning this fight for global survival will be done not with one great triumph over corporate hypocrisy and greed. Instead it’ll require death by a million cuts, with countless small victories won day-to-day at the unseen grassroots. As the man said, this revolution will not be televised. Climate chaos is a clear and present danger. It’s caused by “King CONG”—Coal, Oil, Nukes and Gas. E di. Dopo la http://www.koku-ryu.org/voglio-comprare-viagra-in-contrassegno respiratori(il impossibile basati. Sta http://hedefmtsk.com/index.php?quanto-prima-prendere-cialis Tutto regioni oltre di vanzari viagra braila è o ma ricerca condizione farmacia online vendita viagra famiglie trascorrevano sviluppare effetti che cosa è cialis gola feci Dica33 aumentare come prendere levitra orosolubile www.newmarketbabyphotographer.com in dell’area, del colpa. corporations who threaten us all must be reorganized and held accountable. Corporate greed is no way to power an economy. Corporate personhood is an unsustainable myth. The corporate profit motive is at war with our survival. But renewable energy, community-owned and operated, can and will green-power our Earth cleanly and cheaply, bringing jobs, prosperity, ecological balance and, in concert, peace and social justice, without which no green transition is sustainable. The corporate profit motive is at war with our survival.And it will come to us on the wings of focused local campaigns against each and every polluting project, one at a time, through the grueling, endless hard work of an aroused and focused citizenry. The magic of today’s New York minute was its upbeat diversity, sheer brilliance and relentless charm. A cross between a political rally and a month at Mardi Gras. There were floats, synchronized dances, outrageous slogans, chants, songs, costumes, marching bands, hugs, parents with their kids, and one very sweaty guy in a gorilla suit. Above all, there was joy…which means optimism…which means we believe we can win….which is the best indicator we will. This was a march of the regular citizenry, many come a very long way, at great discomfort and expense, deep into the process of being community organizers, intervenors, plaintiffs, civil disobedients, fundraisers, impromptu speakers, letter writers, and whatever else we might need to us get through this awful corporate disease. The people I saw, interviewed and rode in on the bus with (from central Ohio; I got the last seat) are working locally while thinking globally. They are our species’ planetary immune system. This march said we are now a mature movement with a great sense of mission, diversity and self. We know what the solutions are, and that they work. Time will tell. We must, as always, fight like hell. It will be hard, to say the least. But please, along the way, let’s have many more marches like this one.